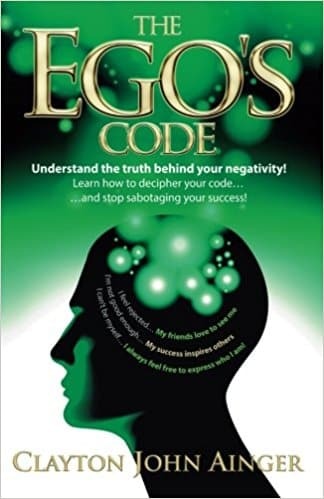 Learn how to decipher your code…and stop sabotaging your success! Every day we all experience negativity whether it be feelings, emotions, actions, behaviour or self-talk within ourselves or from others. For many people it causes them to sabotage success, relationships, health, wellbeing and finances ultimately preventing them from fully experiencing their life and living their dreams. During a meditation at Stonehenge, Clayton Ainger received clear and detailed guidance about why we experience negativity and how to be free of it. In The Egos Code, Clayton explores the spiritual reasons for negativity, its purpose and where it comes from. He explains the effect on the physical body, the mind, how it interacts with spirit and impacts on your life. The Egos Code offers new insights and understanding to change old beliefs and perceptions about negativity. Clayton then invites you to undertake simple and yet powerful exercises to release your negativity, to change your reality, so you can live your dream life. Purchase The Egos Code in Amazon.